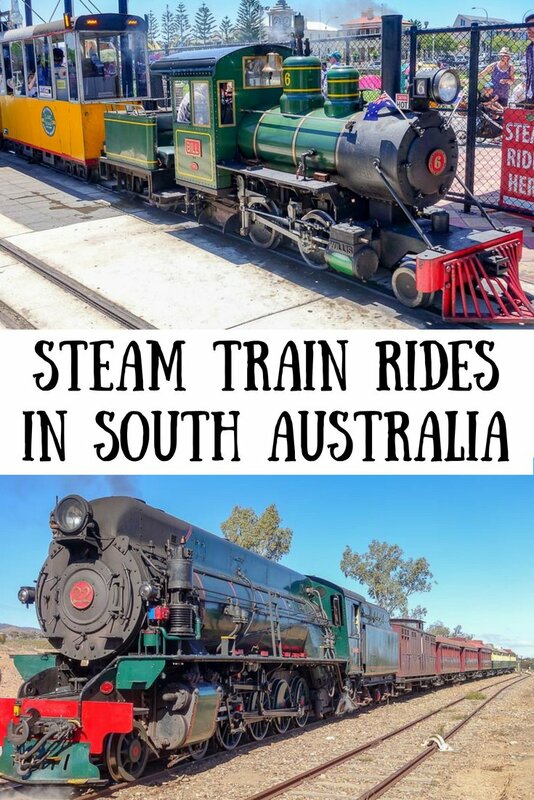 Over the last few years I seem to have gone on quite a few steam train rides here in South Australia. I didn’t realise that we had so many on offer here, and I definitely don’t think of myself as a train enthusiast. There is something about train travel though. It’s noisy, uncomfortable and slow but it brings back memories of yesteryear and reminds us of how simple life used to be. The sound of the horn and the clacking wheels on the railway track, the wind in my hair as I admire the view – it all makes for a fun ride. 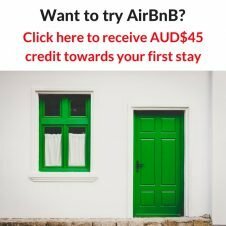 10 Looking for More to do in South Australia? I don’t claim to know anything about how a steam engine works, I just love the romance of a railway adventure. Join me for the ride! The Pichi Richi Railway is the latest steam train I have been on. It runs between the towns of Port Augusta and Quorn in the base of the Flinders Ranges. There are various trips, not all of them running the full distance between the two towns, using different engines and carriages. We took the Pichi Richi Explorer, which runs from Quorn to Woolshed Flat and return. 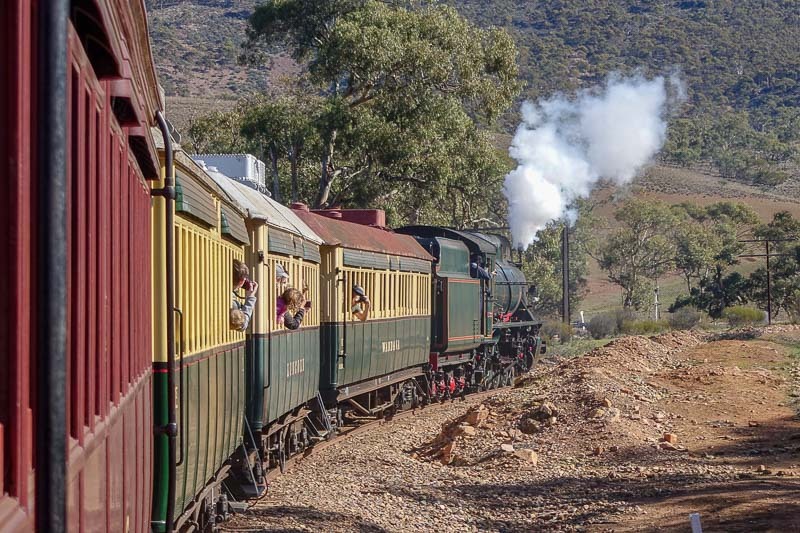 The steam train trips are about 45 minutes each way, and winding its way through the Pichi Richi Pass which has fantastic views of the Flinders Ranges. We spotted lots of native wildlife on the trip too, which was very exciting for the international visitors in our carriage. I loved being able to hang out the windows and enjoy the trip as it would have been done a century ago. The steam railway in this area first started in 1879, and it was part of the main north-south line in Australia. The first trains in this area were called The Afghan Express, the predecessors to today’s Ghan that runs from Adelaide to Darwin. Since 1973 work has slowly been undertaken to preserve and rebuild this line and the various engines and carriages that ran here. Some of the other trips available include a full day trip from Port Augusta to Quorn and back, trips using the only “Coffee Pot” engine left running in the world, and a Barwell Bull diesel engine trip too. The train trips are seasonal, only running in winter because unfortunately the steam locomotive poses a very real fire risk during the hot, dry summer months. The SteamRanger Heritage Railway runs a whole pile of different steam trains over different routes to the south of Adelaide and in the Adelaide Hills. One of them is the Cockle Train, which I will talk about separately below. Most of these steam trains run irregularly throughout the winter months, including trains that run in the evening with a gourmet dinner served. Every now and then they even put on a “Mystery Tour”, where all the details you are given is where and when the train is leaving, and approximately when it will be back. It’s also a surprise exactly which of the various old steam engines they will use. What a fun day out! The SteamRanger Heritage Railway currently has two steam engines and two diesel engines they use to run their various train trips. These old trains have been lovingly restored to show off their previous glory. While most trips are steam rail excursions, some are run especially with the diesel engines or the diesel engines can be substituted during high fire danger days. The Cockle Train is the most frequently run of the SteamRanger train trips and it is the one I have been on more than once. 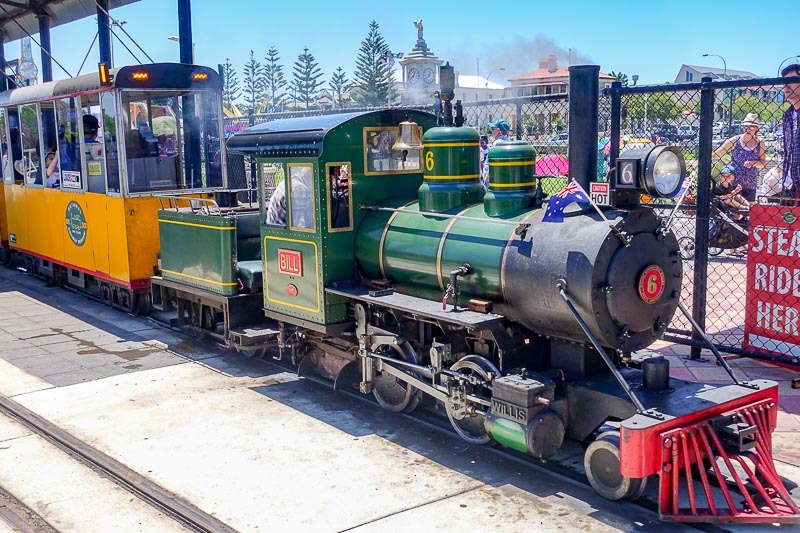 It runs from Goolwa into Victor Harbor and back, three times each day it is running. This means that it is possible to do the return trip from either end. 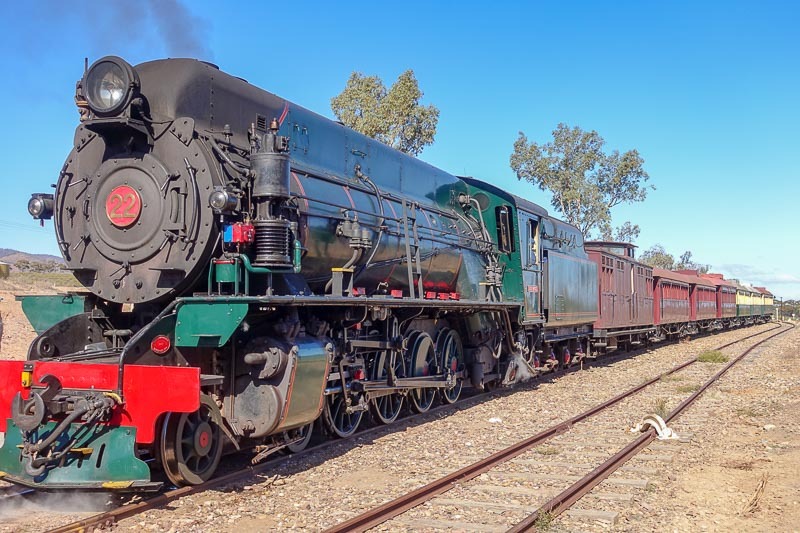 As with all of the other steam trains in South Australia, it is sometimes necessary to swap the steam engine for a diesel one for fire danger and other reasons, and that is exactly what happened on my most recent trip. 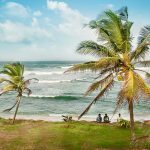 This did not diminish my enjoyment, and we were still able to enjoy these fabulously scenic train rides along the coast and back. 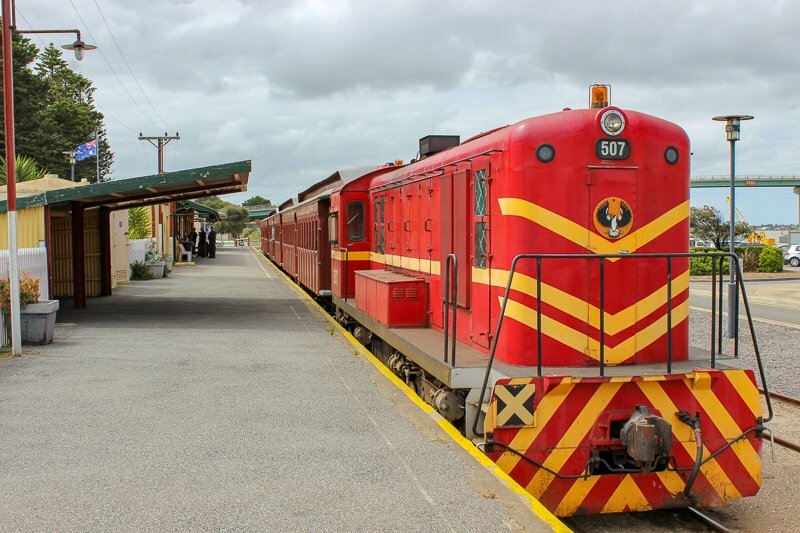 Located in Semaphore, this little train runs for 2km along the coast, past Fort Glanville to a stop at Point Malcolm Reserve. It’s run by the National Railway Museum (see below) mostly on the weekends and during school holidays from September to April. 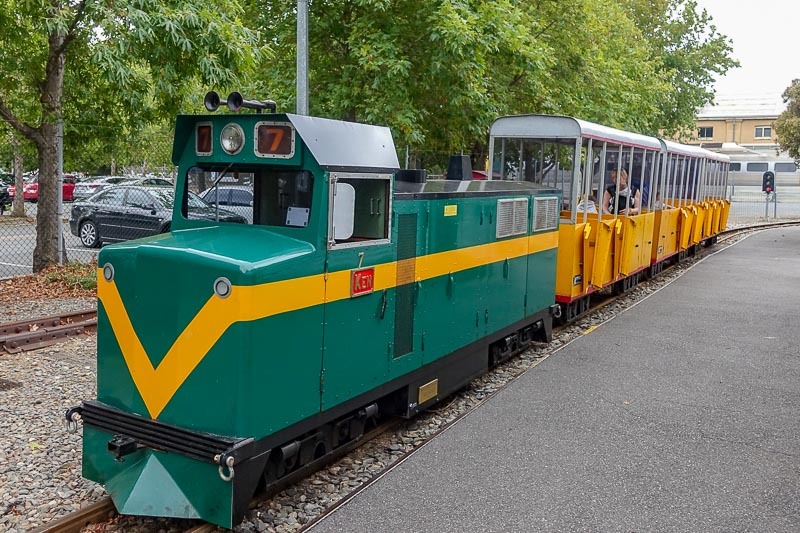 This is one of the best train rides for kids being easily accessible and short enough that they will not lose interest. The cute little steam engine “Bill” pulls along three little covered carriages, so even if there is a little rain about or the sun is strong, passengers are protected. The National Railway Museum is located in the heart of Port Adelaide and showcases all things related to trains and train history. Here you will see not only many different restored steam trains, visitors can also do some historic train rides too. Every day there are free rides included as part of the entry ticket, usually these are run by “Bub”, the pair to the steam loco “Bill” who runs the Semaphore steam rail excursions. On special event days though, it is possible to ride on other trains too, such as a bigger steam train called Peronne and a Bluebird or even an old Adelaide Redhen. There are even occasionally days where events are occurring and it is is possible to drive a steam train. The museum is a fantastic day out with not only steam engine history, but model railways and plenty of interactive displays for the kids too. I really enjoyed learning about how the railways shaped our local history and climbing in and over dozens of old steam trains to see what they were really like. Throughout the state there are various miniature railways that run a couple of days a month, usually on Sundays. These are almost exclusively run by rail enthusiasts volunteering their time to enjoy these little steam trains. Mostly these miniature trains are just a ride on train to sit on as it chugs around a large model railway track. Kids in particular will love getting a small taste of riding an old fashioned train. This is a trip I haven’t done but am most keen to try out. Beyond the Vines Wine Tours offer tours from either Adelaide or Mount Barker that include a train leg on one of the SteamRanger trains from Mount Barker to Strathalbyn. Later in the tour you meet the train again in Goolwa for the return journey back to Mount Barker. During winter it is usually a steam engine, but in summer it is more likely to be a diesel. The tour includes visits to local towns, two wineries, a craft brewery, a two-course lunch and all transfers. There is also a premium version of the tour that includes a three course lunch and visits to five wineries. The run on various Sundays throughout the year – check below for the dates. Now these are not steam trains, but it would be remiss of me to talk about trains in South Australia without mentioning the two iconic train journeys in Australia, both of which pass through Adelaide. The Ghan runs almost 3000km from north to south in Australia between Adelaide and Darwin. 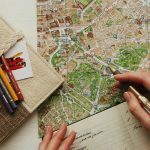 The whole journey takes about four days, but the travel is done in luxury and there are stops in local towns along the way to allow for day trips to see the attractions. 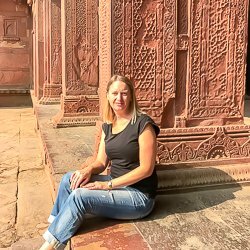 The Indian Pacific is the longest transcontinental railroad journey and it goes from East to West across Australia from Sydney to Perth wth a stop in Adelaide along the way. The almost 4500km journey is done in four days with a couple of small stops. 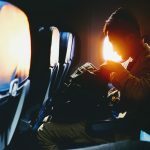 It is also possible to do the trip in legs from Sydney to/from Adelaide or from Perth to/from Adelaide. There is also a third option for interstate train travel, The Overland, which goes from Adelaide to Melbourne and back twice a week. The train leaves early morning each way, doing a daytime trip of 10.5 hours. 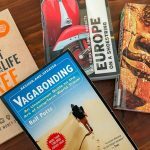 Looking for More to do in South Australia? I have many posts on the things to do in this often neglected part of Australia. Click through and have a read. Enjoyed this post? Please share with your friends or pin for later.